Before the turn of the 20th Century, undergraduate George Cole convinced Alexander S. Lilley to coach football at Ohio State. 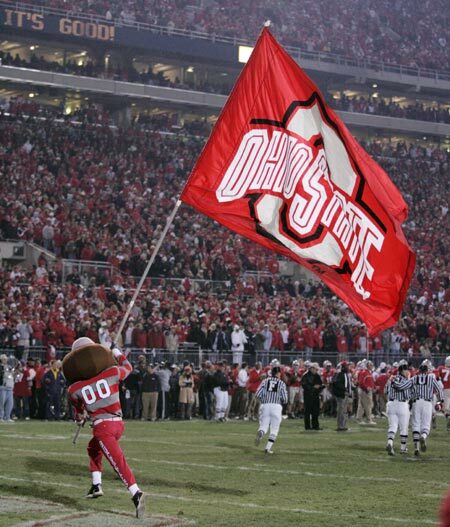 The Buckeyes, a name won by a contest entry, played its very first game on May 3, 1890. So what’s a buckeye? It’s the nut part of a tree that dominates the Ohio valleys. The team enjoyed some highs and lows all throughout their career, but it wasn’t until 1965 that a mascot made its first appearance. Ray Bourhis is the man that came up with the mascot idea. The student organization, Ohio Staters Inc, helped with the construction of the nut. On October 30, the nut made its first appearance at the Homecoming game against Minnesota. It was received well but only lasted a couple of weeks, due to it’s weight. A new fiberglass one showed up on November 12 for the Iowa game. It was a week later that Kerry Reed submitted the winning name and which we know as Brutus Buckeye. 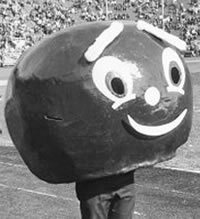 In December of that year, the job of maintaining Brutus became the responsibility of the “Block O,” a student run organization. The large nut shrank down to the current size in 1982. So let’s take a look at the current incarnation. The giant nut head marks the presence of Brutus. He’s a buckeye nut with eyes and a mouth. From then on, it’s all man. The stripped grey and red covers the top part of the body. A pair of red warm ups. He’s got a swanky pair of sneakers and a grey pair of gloves to boot. Finally, the vaunted baseball cap tops this big nut with the familiar ‘O’ painted across the head of it. That’s one pretty tight looking nut. Brutus is all his own in terms of unique mascots. It’s no wonder he was nominated for the Capital One National Mascot of the Year in 2002-03. Unfortunately, though, he hasn’t been noticed much since. We enjoy the attempt to make Brutus’ uniform stand out a whole lot more. But at the end of the day, Brutus is still just one big nut. The tradition is there, but unless you are a part of the state, one has a hard time getting it. 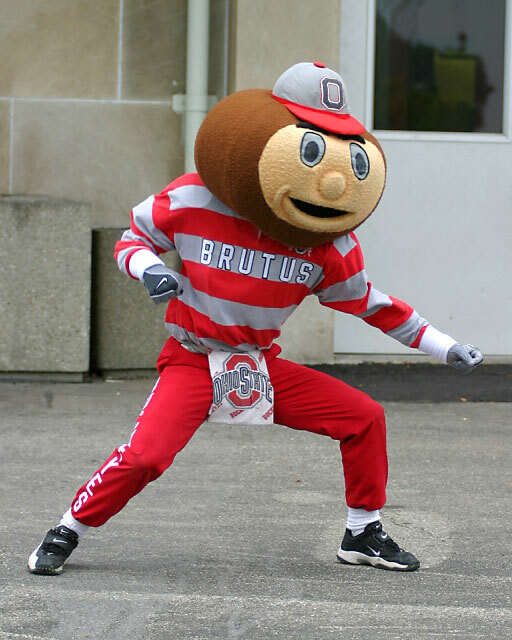 Now we’ve seen some terrible mascots and Brutus is way better than that. He just doesn’t take the top spot. That’s how we (and Phil Steele) feel about Ohio State in terms of the team this year. They will be in the mix and make sure to represent the Big 10, but we just don’t think they will walk home with the crystal football. Sure Terrell Pryor is back and will be in the running for the Heisman Trophy, but it’s just not enough. We’re feeling the Buckeyes will bust a nut on the road somewhere in the tough Big 10 Conference. At lease we can be sure that Brutus will be there cheering them on and we can also be sure that we got the record for mentioning the word ‘nut’ the most times in an article.